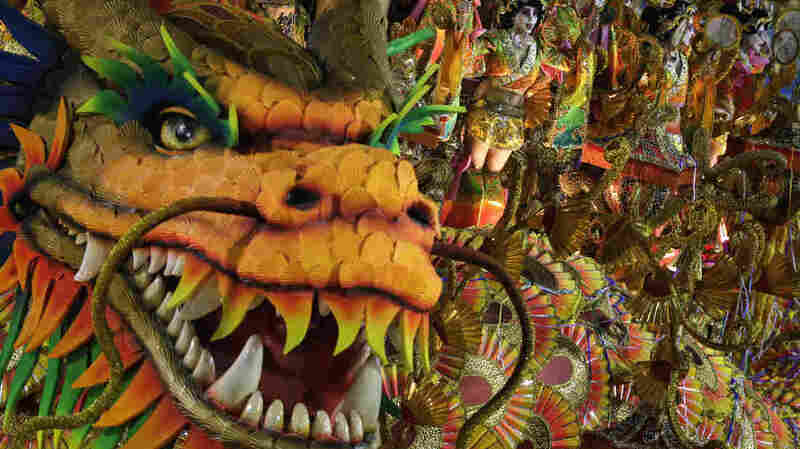 Samba School Outrage Points To Carnival's Murky Financial History One of the top schools competing in the Carnival parade received $3.5 million from Equatorial Guinea, sparking outrage in Brazil. The move puts a spotlight on Carnival's questionable sponsorships. Performers from the Beija-Flor samba school parade on a float during Carnival celebrations at the Sambadrome in Rio de Janeiro on March 3, 2014. That year, the Beija-Flor parade was centered on a theme of communication throughout history; this year's theme, underwritten by Equatorial Guinea, is more controversial. It's Carnival in Brazil – the five-day wild celebration before the beginning of Lent. And there is no place quite like Rio de Janeiro to enjoy it. But along with the music, costumes and pageantry comes the inevitable yearly financial scandal. This time it involves the samba school Beija-Flor, which is one of the top schools competing for the grand prize in the samba parade. This year the school's routine has an African theme, and their main song, which they will perform in the Sambadrome, is dedicated to Equatorial Guinea. "You can see many examples of very questionable sponsorships during Carnival," says Aydano Motta, a journalist and Carnival expert. And this one has caused enormous outrage in Brazil, especially among human rights groups. The Guinea government offered $3.5 million to sponsor Beija-Flor's production, the biggest sum ever given to a samba school. But the real issue is that Equatorial Guinea is run by Teodoro Obiang Nguema Mbasogo, a dictator. He's been in power longer than anyone else in Africa, since 1979, and he has a dismal human rights record. Human Rights Watch describes the nation like this: "Vast oil revenues fund lavish lifestyles for the small elite surrounding the president, while a large proportion of the population continues to live in poverty." Motta says schools count on sponsorship money because it's getting more expensive to put on this annual spectacle. "The schools don't care about where the money comes from, but they look for it out of necessity," he says. The main samba schools are based in very impoverished areas, but every year the productions get bigger. Some money comes from television rights and ticket sales, but it doesn't cover all the expenses. For years, the samba schools were supported by gambling kingpins known as bicheiros. Now the schools get corporate and government sponsorships. A few years ago, a yogurt brand offered funding, and Motta says it stretched artistic imagination on how to do a samba dance as an ode to dairy. "So there were probiotics costumes, many cow costumes," he says. "It was the strangest theme of recent Carnival history." Motta says the real scandal, though, is that all this money is being used to essentially put on a show. "This year one of the samba schools is being sponsored by Switzerland," he says. "Countries should be giving money that can be used to benefit the population, especially in these poor places."